The first stamp of 1971 was issued depicting the Coastal Embankments of East Pakistan. The Paisa 20 multicloured stamp was issued on 25th February. 1971 was the International Year for Action to Combat Racism and Racial Discrimination. On March 21, a set of two stamps as shown above issued by Pakistan Post. The stamps of Paisa 20 and 50 face value depicted people and the logo of the organization. July 1, 1971 was the 20th Anniversary of the famous Colombo Plan. On this day, a brown-reddish and violet coloured commemorative stamp of Paisa 20 was issued. The stamp depicted the Maple Leaf cement factory located at Iskandarabad. 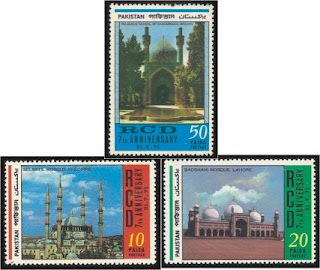 Like all previous years, the Pakistan Post issued a set of three stamps on the eve of 7th anniversary of the foundation of Regional Cooperation for Development (RCD) on July 21. Each stamp depicted the Muslim architecture in Iran, Turkey and Pakistan. The Paisa 50 stamp (above top) showed the famous Chaharbagh Scool of Isphahan, Iran. The Paisa 10 stamp (bottom left) showed the famous Selimye Mosque (Turkey) and the Paisa 20 stamp (bottom right) showed the famous Badshahi Mosque (King's Mosque) in Mogul architecture located in Lahore, Pakistan. 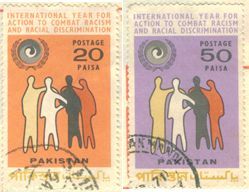 On October 1971, Pakistan Post issued a commemorative stamp of Paisa 20 face value on the eve of the Universal Children Day. 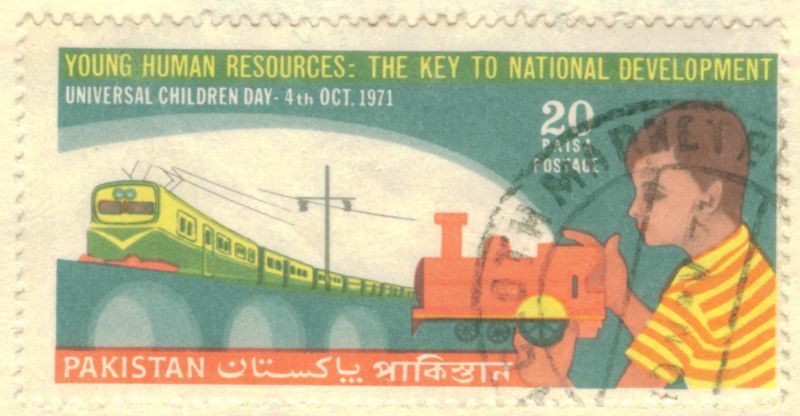 The multicoloured stamp depicted an electric train and a child with a toy train. A set of three stamps was issued on the eve of 2500th anniversary of the Persian Monarchy on October 15. The stamps valued 10, 20 and 50 Paisa depicted Persian horsemen and various symbols of the bygone days. A souvenir sheet (below) was also issued on the occasion. On the eve of holding the first World Cup Hockey championship, a commemorative stamp depicting a Pakistani hockey player and the trophy was issued on 24th October 1971. The championship was held in Barcelona, Spain. Who won the championship - wait to see the last stamp of the year. 1971 marked the 25th anniversary of UNESCO and UNICEF. Two stamps commemorating the occasion were issued by Pakistan Post as seen above and below. The Paisa 20 UNESCO stamp (above) showed the Great Bath of the ruins of Moenjodaro, Pakistan and was issued on 4th November. The Paisa 50 UNICEF stamp (below) showed the UNICEF emblem and was issued on 11th December 1971. Jordan celebrated the 50th anniversary of the Hashimite Kingdom of Jordan. On December 25, Pakistan Post issued a Paisa 20 commemorative stamp that depicted King Hussain and the national flag of Jordan. And the last stamp of the year was issued on 31st December 1971 to commemorate and celebrate the winning of the First Cup Hockey Championship by Pakistan hockey team at Barcelona, Spain. 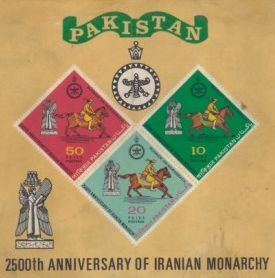 The Paisa 20 stamp mainly in yellow and partly in blue colour depicted the emblem of the Hoceky Federation of Pakistan and the trophy.